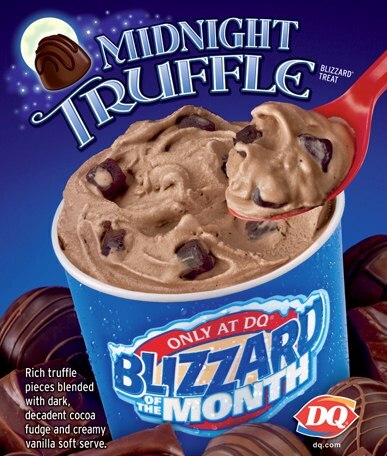 I knew that the midnight blizzard was out at DQ, but I thought I had reviewed it before. Well... 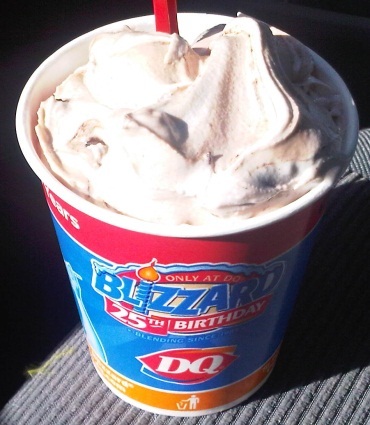 I was wrong, and considering that today day was effectively sucking, it seemed like a very appropriate time to head out and visit the brand new DQ they built near work. And here's the real thing. Wow, it's so amazing, it's glowing!! Ok, ok, that's just my cellphone stressing out over the massive sunshine blazing through my windshield. Hmmmm, let's try taking this picture again. Ahhhhhh, that's a million times better. Now you can only see a few truffle pieces on the left hand side there, but no worries, there's a million of them in there. I literally had a few in every spoonful. 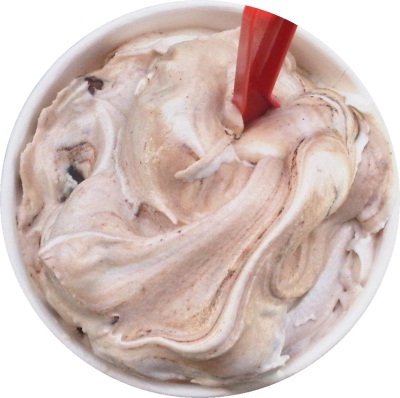 Unlike the dark rich brown color of the advertisement, we've got some remaining white vanilla soft serve with streaks of brown "dark, decadent cocoa fudge". It looks pretty good, though I am a little afraid. As is expected of DQ, it's pretty good. I can't quite nail down the right word to explain what the chocolate tastes like. It's reminding me of something but I can't place it. Like I said, there is just truffle after truffle in this treat. They can be a bit spongy, almost like a small chocolate marshmallow, but overall I like them (especially the less spongy ones). Just thinking out loud here, but I'd almost like to try this treat with some hard chocolate chips mixed in. You would get this great mix of hard chunks and soft bits in every bite, almost like when you mix cookies & cream and cookie dough. Ok, this one is definitely good enough to go give it a shot, you've got about a week left to try it.